Find your favorite haunt in Rome! 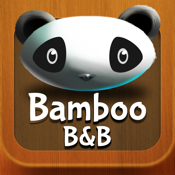 With Bamboo B&B you'll live your stay in our Bed and Breakfast, located in the green heart of Monteverde, at its best and receive all our news and updates. Whether you're looking for information on transportation or museums, or simply wishing to take cute picture, we have the feature you're looking for! •Contact: find us on the web or call us directly! Our mascot, Puck the Panda, is waiting for you!